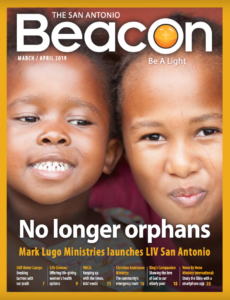 CAM has partnered with The Beacon, a local Christian magazine who shines a light on some of the good things happening in this community. CAM was approached by a member of The Beacon asking to partner with us. The magazine is sponsor driven, and two of our very treasured partners and supporters, Punchdown Communications and John R. Hannah & Co., LLP, sponsored a 2-page article highlighting CAM’s story. Click here to access the online magazine; CAM’s article is on pages 16-17. CAM is so incredibly excited about this new partnership. 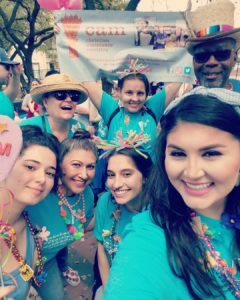 One of our many goals is to highlight our story in the San Antonio community as there are so many people who don’t know about our organization. Being informed about CAM could help so many people in need. The more we discuss our organization and what we do and who we help, the more we’re preparing people with the information they need to share with those who may be in need of one or many of our services. We hope you take a few minutes and read our article, as it’s a beautiful representation of our ministry. Wow! We are truly humbled by your generosity during The Big Give SA! You all brought in $23,549.85 (and counting!) this year for CAM, and even though it was just short of our goal, we are so grateful for this gift from the San Antonio community. YOU made a difference in this community. YOU made a difference in the lives of so many people in crisis. Please feel proud of yourself. You’ve changed someone’s life for the better. This money will go towards providing clothes, food, bus passes, ID and birth certificate recovery, daily lunches and so much more so our clients can get back on their feet! Aside from the money raised, we were also able to visit with so many potential volunteers and donors. You can’t put a price tag on a future volunteer/donor! We look forward to doing this again with YOU next year in 2020! Guess what CAM fam! Donating to CAM just got a whole lot easier! We know our supporters and donors have busy lifestyles, and not everyone has the time to go and shop for us, or they may not have the time to stop by our campus to drop off their donations. Well, good news….CAM now has an Amazon registry! Like a baby or wedding registry, we’ve added some of our most needed items to this list and you’re able to pick and choose what you’d like to donate to CAM, and once you’ve purchased, it’ll get delivered straight to our organization! Click here to access CAM’s Amazon registry. If you have any questions, contact our Director of Development, Sarah Kory, at: skory@cam-sa.org. Join us for lunch followed by a tour of the Historic Dulling House and CAM’s client services. You’ll be sure to learn what CAM does on a daily basis and see where you can help our ministry! Check out our Facebook page for more info and to RSVP. If you have any questions contact Sarah Kory. Huge Philanthropic Gift for CAM! CAM is most honored to share that we were one of a handful of nonprofits awarded large financial contributions by Harvey Najim as part of a matching grant with the SAAF/Santikos and Valero. For several years now we’ve been planning, partnering with our neighbors, and developing a strategic vision for serving another 40 years that will allow us to serve more and serve better. Our donated property, gifted to the organization by Grace Lutheran Church, is an incredible location for serving those in need and for creating a convenient location for people to volunteer and donate items to implement our mission. However, we realized that we needed to be good stewards of the property and utilize the space to its maximum capacity. On September 6, 2018, Harvey Najim officially announced that he will be awarding Christian Assistance Ministry $500,000 to begin this incredible property maintenance, improvement and expansion of our existing 5,500 square foot warehouse that will include adding heat and air (something it has never had) and it will mean that we can make an incredible difference in the lives of the 50,000 working poor families and over 14,000 children in need of a hand-up in our community. Click here to access to formal press release. Join us in thanking Harvey Najim! 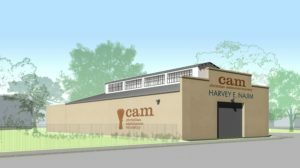 To learn more about CAM’s vision, plans for the future and working with others along McCullough Ave click here. The wheat logo for CAM references our commitment to sharing and caring for all of those in need by feeding them, clothing them, by providing financial assistance and by feeding their soul through grace and love. Wheat is often a symbol of life, sustainability, charity and love. Wheat is a global sustainer of life being utilized to create various forms of bread in different cultures. Historically people planted, harvested and broke bread together for the betterment of their community. Celebrating this incredible bounty by giving back was and is an important part of all cultures. Today many of us harvest in different ways and sharing our bounty with others is still incredibly important. : "When you harvest the crops on your land, do not cut all the way to the corners of your field. Don’t pick up the grain that falls on the ground. Leave it for the poor…"
Just like a triage or emergency room, people come to CAM in all sort of crisis. No appointment is necessary and all are welcome. We work with over 200 volunteers in San Antonio, Texas. Want to join our community? Every person who comes to CAM, regardless of beliefs, is considered a child of God. Help is extended to all clients through the distribution of food, clothing, financial assistance, or by referrals to other agencies, prayer and a listening ear.